KARTAKA, Helmand province, Afghanistan â U.S. Marine Lance Cpl. 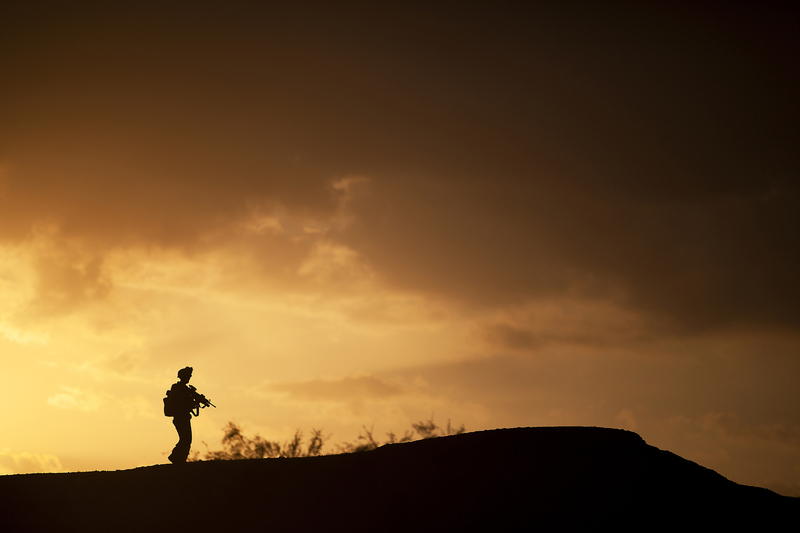 David Rodriguez, a 21-year-old fire team leader with 3rd Platoon, Lima Company, 3rd Battalion, 3rd Marine Regiment and native of Riverside, Calif., walks along a ridgeline after clearing compounds with Afghan National Army soldiers during Operation Tageer Shamal(Shifting Winds) here, Jan. 4. Over the past five years, coalition forces have operated with Afghan National Security Forces to defeat the insurgency in the central Helmand River valley. Driven from the green zones, or populated areas, of districts in southern Helmand, enemy fighters have sought refuge in bed-down locations west of the Helmand River. This area on the outskirts of Garmsir district has been, until now, nearly untouched by the partnered forces and the Afghan government. During the operation, Jan. 4-8, Afghan forces and Marines with 3/3 cleared the area of insurgent activity, weapons and improvised explosive device-making materials, and held shuras to address the concerns of local elders.